Thanks France for doing your video on this card. I always thought it was much harder to put together than it actually was. 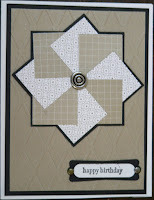 I used black CS and then the rest of the paper came from the Hostess level 1 Patterns Pack. I used an embossing folder on the background piece to add a little dimension and I put Craft Chocolate Chip ink on the brad to give it some color. The sentiment is from Teeny Tiny Messages. I hope you have a wonderful week!